Now that it's officially December, I feel like it's finally appropriate to share these photos of my Christmas tree! No shame in my game- this has been up in my apartment with lights on since November 1st. I think that might be one of my new holiday traditions in adult life- getting the tree up the day after Halloween! The Christmas season goes by too quickly, and while there are some things that I don't mind waiting on until right before Christmas (*cough cough overplayed Christmas music*), I am all about getting decorations up as early as possible. Since this is my first year of living in an apartment, it's my very first time getting to decorate at my own leisure for the holidays! My dorm rooms in college never had much space. I had a one foot tall silver tree from Hobby Lobby for the past few years, and would always decorate the door to my room with a holiday garland, but that was about the extent of my college decorating. Now that I am out of school, I was too excited to finally have the chance to decorate my little apartment, and not just a college living situation! 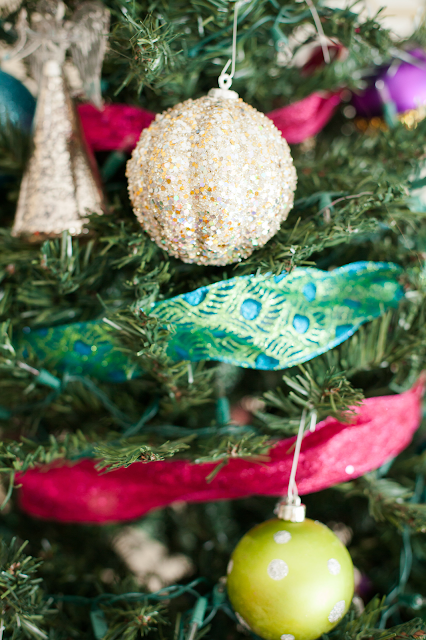 My decorating inspiration for Christmas came from Emily Gemma from The Sweetest Thing. I've been obsessed with Emily's Christmas trees for a few years now as I've been a longtime reader of her blog, but the one that she and her husband John had in their home last year was absolutely unbelievable! I had all the heart eyes as I read that blog post from my dorm room- haha! My tree is green obviously so it couldn't be quite identical to Emily's tree, but I was definitely inspired by the colors, and using ribbon embedded in the three and building a 3D unique sparkly tree topper. My tree was actually given to me by my sweet blog photographer, Deeana! She and her husband moved into a new home this year, and had the opportunity to buy a larger Christmas tree. So she gave me their old one! I think that it was the perfect size for my living room. 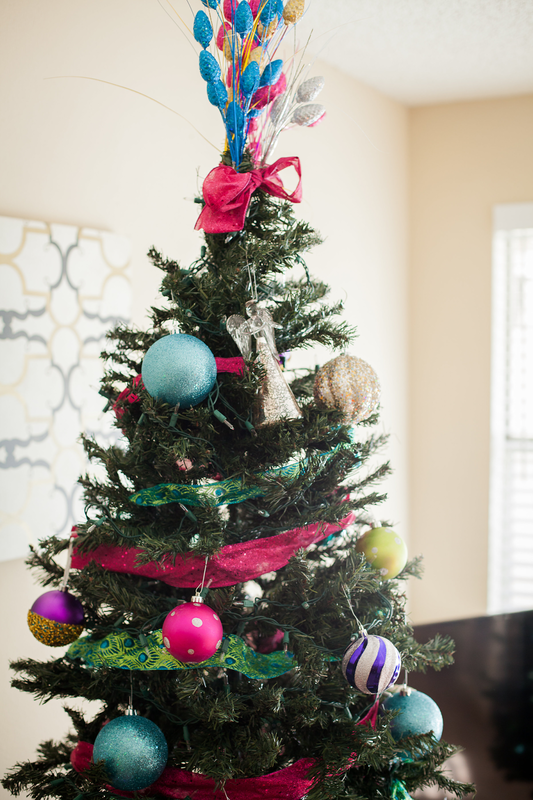 All of my ornaments are from Hobby Lobby or At Home, but I've linked some in similar colors and styles here below. Have you already decorated your home for the holidays? What is your decorating style? Hope that y'all will be having a great weekend. This was a very long and weird week for me- more on that in next week's Midweek Ramblings post. On a happier note tonight I will be attending the last of four blog events that I went to this week- I'll try and share a recap post of everything soon! So much happens at this time of year! I LOVE your tree! We just decorated our first one and it was so special! There's no way I could have gotten my fiance to decorate our tree like that, but we both had a blast putting up ornaments and listening to Christmas music! Love the colors you chose! Decorating for Christmas is one of my favorite things to do. 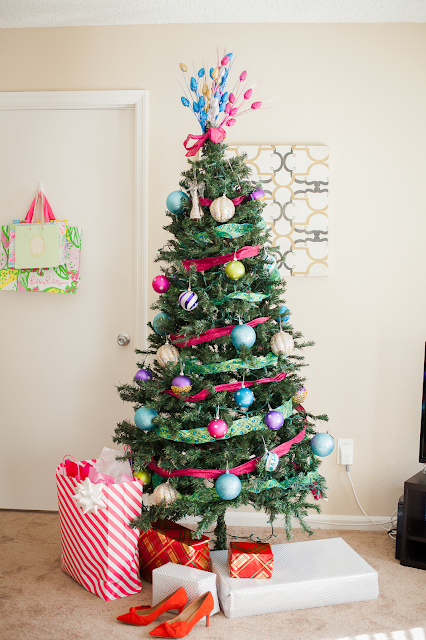 I love how fun and colorful your tree is! Congrats on your first tree! It so reminds me of my first tree! I had so much fun choosing whatever I wanted! Enjoy it! I love it, I have been in Christmas mode since nov.1 too so no shame in that! Share a picture with the lights on it! Your tree is so cute, Annaliese! How perfect that Deeanna was looking to get rid of it! Wow! Your tree looks beautiful. I love how colorful it is! Ahhh so pretty!! I'm a bit late decorating my Christmas tree, but I'm doing it this weekend! I love the glittery ornaments! Wow! Your tree is stunning! My husband and I started decorating our tree tonight but it's a work in progrsss for sure!